I'm creating a dialog which has a JPanel uses JGoodies's FormLayout. I added some components but then decided to remove some of them. 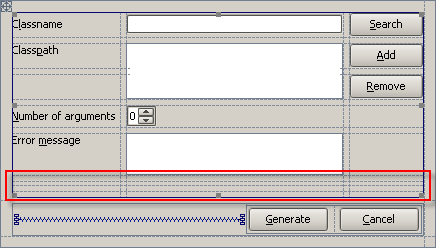 In design form, it still display grid rows which are used as place holders for those components. How can I removed them? Seems I need to open .FORM file to remove them. I think it should be removed automatically or some easier ways to remove them. be a right-click popup action to remove unnecessary grids. removed automatically or some easier ways to remove them. t> I'm creating a dialog which has a JPanel uses JGoodies's FormLayout. t> holders for those components. How can I removed them? select "Delete Row" from the context menu. but the report text could be better.